There are some destinations where a certain attraction becomes as popular as the destination itself. Munnar is one such place and its tea plantations have reached dizzying heights of fame making it as the biggest attraction of this hill station. These tea gardens are a delight and one can gaze at it oblivious to the surroundings. There is no end to these plantations and aroma of tea as long you are in the hills of Munnar. A part of Western Ghats and located very close to Tamil Nadu border, Munnar lies at an average height of more than 5200 feet above sea level. It was once the summer resort of British Raj who were also responsible for the tea plantations which took its root in late 19th century. Presently, the tea plantations are under KDHP (Kannan Devan Hills Plantations), the company which looks after all the plantations and is employee owned with most of the employees being share holders. Munnar gets its name from the confluence of three rivers (Moonnu- aaru) here- Nallathanni, Kundala and Muthirapuzha. Munnar is home to Anaimudi, the highest peak in India south of Himalayas, and is also known for Nilgiri Tahr and Neelakurniji flower which blooms once in 12 years (next one is scheduled for 2018). The crisp air hit me as I had a glimpse of the first of the innumerable tea plantations. Along with that came a waft of the aroma of tea and swaying eucalyptus trees. When in tea country, an ideal way to start is to know more about tea and I headed straight to the tea museum and factory which gave a firsthand experience of tea processing. Apart from the lovely display of artifacts, the museum also gives the visitors an insight into the history of tea plantations of Munnar through a video. Head out in any direction from the town and it leads through meandering roads winding through endless tea plantations and viewpoints overlooking more sprawling estates. The blue sky and the green gardens blend so beautifully into each other to form a picturesque landscape. Amidst the greenery, tea factories make their presence felt and in the late evenings, one can spot many plantation workers taking that long walk back home. After riding through the lovely serpentine roads, I took a detour on the highway to Kochi. The road that leads to Idukki offers magnificent views of more tea gardens with the sun going down the horizon in the background. 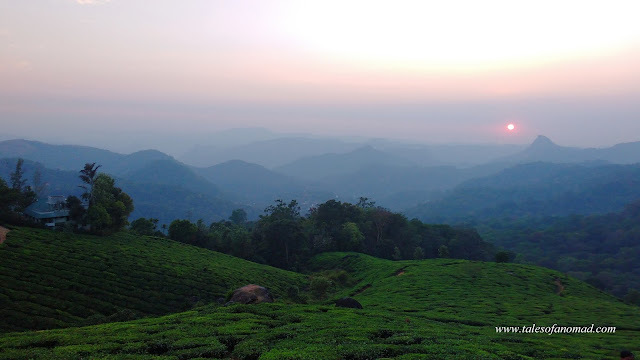 With pink sky and green gardens, this is one of the best view points to enjoy sunset in Munnar. Next day morning, went past numerous plantations from Munnar town and reached the entry gate of Eravikulam national park in Rajamala, from where visitors boarded a bus to go further up. The bus went higher past more sprawling tea gardens finally to stop at the information centre. The centre provides a detailed description of the park, its flora and fauna. The asphalted road further wound up with panoramic views of the surrounding hills and tea plantations. It was quite crowded and the visitors slowly trod up enjoying the vistas. A group of foreign visitors repeatedly focused at a rock through their binoculars. A pair of Nilgiri Tahr (a species of wild goats) stood nonchalantly posing for the cameras. These endangered species are the pride of Eravikulam national park which was formed to protect them from poaching. They are quite shy creatures and disappeared into the bushes shortly. Though the park is known for other animals and birds too, the walk further up was futile except for the vistas. The access to the park is also quite restricted and visitors aren’t allowed beyond a point. This is to ensure that the endangered species are protected with nil human intrusions. Spotted another Niligiri Tahr as the bus drove down the Rajamala hill. Further ahead by the winding road is Lakkom waterfalls, a popular jaunt for travelers. A short walk of 200 meters led to the falls. Despite the water levels not being very impressive, it did look beautiful as it made its way through the rocks. People waded through the ankle high water and jumped over boulders to the base of the falls. The stream is one of the tributaries of river Pambar and has many preceding cascades which are inaccessible. Lakkom falls would definitely be at its best post the monsoons. The road led further past the tea plantations to the renowned sandalwood forests of Marayoor. The trees formed a beautiful frame as the road meandered its way through them. Though access into the forests is denied, this short stretch is a beautiful one to ride through. Marayoor has always been known for its sandalwood forests and jaggery. I dropped into one of those small sheds that made jaggery. In the pretext that I wanted a sugarcane juice which they sold, had a peep into the preparation of the same. The sugarcane juice is heated for long hours before they become semi solid and are then made into big jaggery balls. The big attraction at Marayoor for travellers is its Dolmens or Muniyaras. These are burial sites from megalithic ages (from 1000 BC to 6 CE) and are locally referred to as Muniyaras. Atop a hill known as the mount of the spirit, the dolmens were built in memory of ancestors and have a horizontal slab with two supporting slabs. I walked up the hill which offers lovely vistas all around and is a nice place to rest yourself in peace. Though fenced, they are not well maintained. Madupetty dam is probably the second most popular place of interest in Munnar after Eravikulam national park. I was there early in the morning and the azure waters of the dam gleamed as the sun rose higher. The clouds floated quite low and the hill in the background accentuated the beauty of the expansive dam. Went past the numerous stalls selling a plethora of items and strolled along the periphery of the dam. As you walk around, the views change. A lone foreign visitor sitting under a eucalyptus tree exclaimed, “It’s so beautiful here”. “It is absolutely serene”, I responded with a smile. I sat next to him for a while and we gazed at the unparalleled natural landscape. There are boating facilities here which the visitors can explore. Echo point, a few kilometers down the road along the madupetty dam is another point of interest on this stretch. True to its name, it echoes when you shout out to the hills here. There are boating facilities here too. Sethuparavathipuram dam or Kundala dam popped up as I rode the same road that led to Top station. This is an arch dam set against a serene backdrop. However, there was some restoration work under progress and access was denied. I was just two kilometers into Tamil Nadu, and the tea estates disappeared as tall craggy hills with deep gorges and shola forests took their place. The landscape had a drastic change from the rolling hills. Top station is known for its watch tower which offers panoramic views of the surrounding hills which include Kolukkumalai (highest tea estate in the world), Palani hills and the tribal settlements way down. Top station was the access point for the British who worked their way up from the plains of Bodinayakanur in Tamil Nadu in late 19th century. Workers were made to carry their luggage and family with help of ponies and mules on this bridle path. Later when the tea plantations took shape, chests of tea leaves were carried down the hills using a rope way from Top station. Apart from the view point, there is also a trek route that leads down to an extent on the path that was used a couple of centuries ago. These hills are also home to Nilgiri marten and a wide range of avian fauna. Gobbling down some bread and omelette near the watch tower, I contemplated whether to visit Koviloor and Vattvada, two tiny villages on the road to Kodaikanal from Top station. Known for their vegetable cultivation, I decided to go and rode ahead. Pampadum Shola forest that I had to pass through came as a pleasant surprise. It was probably 5-6 kms through the forest, but the serpentine ride through the tall eucalyptus trees was absolutely surreal. Koviloor and Vattavada are adjacent villages surrounded by forests and have stepped cultivation of vegetables. Though there wasn’t much I could see with regard to cultivation, I could envisage how gorgeous the villages would be when in full bloom. CSI church, a bit away from the town was my last point of visit before heading out of Munnar. Atop a hillock,this church is a visit to Munnar’s colonial past. It also houses a cemetery with many tombstones. It is said thatin late 19th century, the newly married wife of a British plantatation manager loved Munnar so much that she wanted to be buried there. Coincidently, she died a week later due to cholera. She rests peacefully in the premises of this church. Along Munnar- Thekkady route, there are quite a few vantage points which offer views of the spread out tea plantations and Anairangal dam. There are numerous falls near Munnar such as Athukad falls, Cheeyapara falls, Valara falls which come alive during the monsoon. Chinnakanal lake and Kolukkumalai tea estate are other interesting places to visit in Munnar. With a salubrious climate and breathtaking landscapes, Munnar is a charmer in its true sense. You just cannot have enough of it. Places such as Marayoor (40 Kms), Top station (35 Kms) and Koviloor (45 Kms) are far from Munnar town. Nearest airport is at Cochin (110 Kms), nearest rail head is at Ernakulam/ Cochin (130 Kms). There are numerous buses plying between Munnar and other places such as Cochin, Pollachi, Coimbatore etc. Being a popular tourist destination, Munnar has numerous restaurants and small eateries. Almost all the hotels and resorts have their own restaurants which serve Kerala cuisine and other cuisines too. Munnar offers a wide range of stay options from budget hotels to luxurious resorts. I stayed at Noah's Ark, a good budget option near KSRTC bus stand. Amazing post.. bookmarked this page for our future reference .. thanks for sharing. Thank you. Glad it would be of help. Wonderful place. Nice and crisp narration. Oh wow!! -- the vistas. So so lovely. And you got to see the Nilgiri Tahr? It wasn't our lucky day when we were there. :( That seems like a long time ago. I hope their numbers have increased. Yeah, its beautiful frames all over. The tahrs were there for hardly a few minutes, lucky to be there at that time. The dolmens are Munnar's Stonehenge, but the sad part is they aren't taken care of properly.